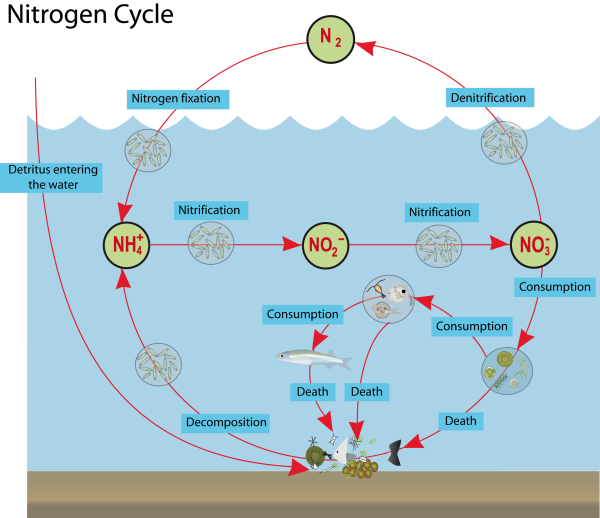 The marine nitrogen cycle is one of the most complicated biogeochemical cycles in the ocean. Nitrogen is a biologically limiting element and changes in its form, or concentration, can cause changes in the cycling of other elements, such as carbon and phosphorus. Marine nitrogen cycling has been and will continue to be an integral component of ocean biogeochemistry, so everyone should know at least the basics. Nitrogen is an element that exists in more forms than almost any other element. Dinitrogen, or N2, is an essentially inexhaustible, inert nitrogen source that is the dominant component of the air we breathe (~79%), but it is inaccessible to most living organisms as the two nitrogen molecules are tightly bound together with a triple bond, which is difficult and energetically costly to break. Picture the triple bond in N2 as a Chinese finger trap, where your fingers are the nitrogen molecules. Even if you exert massive amounts of energy, you’re probably not going to be able to pull the trap apart. Before Fritz Haber, a man who dared wear temple-less glasses long before Morfeo (of Matrix fame) made them cool, discovered how to chemically synthesize ammonia (NH3) in the laboratory in the early 1900s, only lightning strikes and a small number of organisms, known as diazotrophs, were able to break the triple bond and fix N2into bioavailable forms. Diazotrophs use an enzyme called nitrogenase to break the triple bond of N2. Nitrogen fixation is still energetically costly for these organisms as they use up 16 ATP molecules in the process; however, the energy expenditure is worth it because it gives diazotrophs an advantage over non-fixers in the environment, and allows them to flourish in nitrogen deplete conditions. Although nitrogenase is an amazing enzyme, it’s pretty fussy about the conditions under which it will function. Nitrogenase is composed of two iron associated proteins, so iron deficient regions cannot support diazotrophic growth. It is also oxygen labile, so nitrogen fixation must be carried out anaerobically; this can present difficulties, which diazotrophs overcome by spatial and/or temporal segregation from intracellular oxygen and oxygen production. Diazotrophs do save energy where possible. There are two isotopes of nitrogen: 14N and 15N, where 15N contains and additional neutron making it slightly heavier than 14N. In the air the ratio of 14N to 15N is roughly 99.5 to 0.5. Whenever possible, diazotrophs will preferentially choose to break the triple bond between two 14N molecules because it is lighter than an N2 coupling involving 15N, which skews the ratio of 14N to 15N higher in these organisms. This is known as isotopic fractionation. Diazotrophs assimilate some of their newly fixed nitrogen into their own tissues, which gives them a distinct light nitrogen signature compared to other organisms in the environment that don’t have a 14N assimilation bias. Quantifying this signature has allowed us to track the new nitrogen produced by diazotrophs through the nitrogen cycle. In oligotrophic areas of the subtropical and tropical marine environment where surface nutrients are low, many organisms rely on diazotrophs, such as Trichodesmium or the endosymbiotic Richelia intracellularis, to fix dissolved N2. My PhD research focuses around these two diazotrophs and their fate, so more about them in my next post. Capone, D. G. (2001). “Marine Nitrogen fixation: what’s the fuss?” Ecology and Industrial microbiology 4: 341-348. Gruber, N. and J. N. Galloway (2008). “An Earth-system perspective of the global nitrogen cycle.” Nature 451(7176): 293-296.